Trinidad Butch T. Strain Scorpion-(Capsicum Chinense)-Have you ever been stung by a Scorpion? Now from the tropical Island of Trinidad comes the Trinidad Scorpion chile. It is much hotter than the Bhut Jolokia and Naga Morich. It captured the Guinness World Book of Records for Hottest Chile in 2011 coming in at over 1,400,000 Scoville Units of Heat!The Island of Trinidad is in the Caribbean northeast of Venezuela. Trinidad Scorpion pods have a smoother skin surface than a Bhut Jolokia or Naga Morich. But are more plump and sometimes have a little tail. The tail gives it the nickname Scorpion. It has a slight fruity and citrus flavor. Trinidad Scorpion Plants produce abundant pods. The pods ripen from green to orange to red. 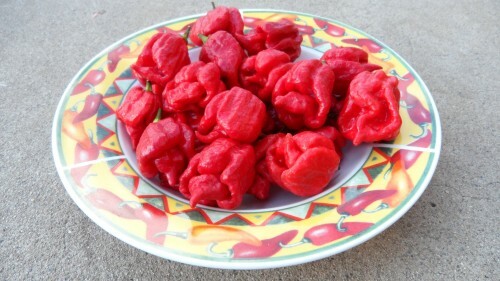 Most of Trinidad Scorpions growing here in the United States are the smaller, hotter variety called the Butch T Strain. YOU ARE BUYING DRIED PEPPERS BY THE KILO. IF YOU WANT LARGER AMOUNTS FOR MANUFACTURING CONTACT ME FOR BETTER PRICING STRUCTURE. IF YOU ARE OUTSIDE OF THE UNITED STATES AND WANT LARGER AMOUNTS CONTACT ME. THESE PEPPER PODS YOU ARE PURCHASING HAS BEEN FROM PEPPERS GROWN OUTSIDE THE UNITED STATES.